Monaco-based tall ship sailing specialist Star Clippers has started construction on a new vessel, its biggest yet and its first new-build in 15 years. Flying Clipper will be delivered in the first quarter of 2018 and is being built by the Brodosplit shipyard in Split, Croatia. The vessel is modeled on France II, a legendary sailing ship that, when it was launched in 1912, was the world's biggest. Just as Star Clippers' owner, Swedish entrepreneur Mikael Krafft, modeled his last new-build (Royal Clipper) on the German sailing ship Preussen, he has turned to another great ship of the early 20th century for his inspiration. In fact, it's more than inspiration; the new ship's rig will be identical to that of France II, which sank in 1922. The ship will be the biggest and most ambitious yet for the company, carrying 300 passengers and 140 crew members. It will measure 8,770 tons and be powered by 39,288 square feet of sail, in addition to specially designed, fuel-efficient engines. The vessel will have 150 cabins, including 34 balcony cabins and four Owner's Suites. The regular cabins will be compact -- this is a sailing ship, after all -- but with decent sized bathrooms, decor that reflects the Golden Age of clipper ships (lots of polished wood, brass and prints on the walls of beautiful ships under sail) and plenty of smart storage. There will be one restaurant onboard, spanning two decks, offering open-seating dining. Meals will include a buffet at breakfast and lunch, with dishes like omelets and pasta made to order from a separate station. Dinner will be served, with a choice of dishes and daily vegetarian options. Occasional barbecues will be held in the Tropical Bar or ashore. 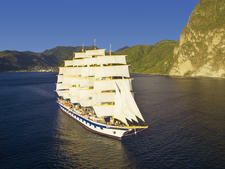 There is no room service on Star Clippers' ships, although tea, coffee and fruit are always available. The focal point of the ship will be the alfresco Tropical Bar, a Star Clippers hallmark, covered but with the sides open to the elements. It's where musical entertainment, talks, exercise classes and shows take place. 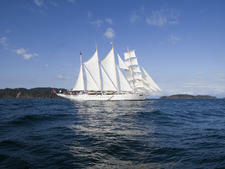 On Star Clippers' ships, "shows" mean homespun entertainment, such as passenger talent shows or a crew fashion show. Inside, there will be an elegant Piano Bar for those who prefer shelter and air-conditioning. The ship will also have a Dive Bar by the diving pool on the aft deck, with music in the evenings, to offer an alternative to the Tropical Bar. This is the first time Star Clippers has made space for an alternative evening venue, and it's hoped that younger cruisers will spend their time in the Dive Bar. There are two plunge pools on deck (one with a glass bottom, filtering watery light into the atrium below) and a spectacular scuba diving pool near the stern, dramatically descending some 18 feet through two decks, with glass sides so passengers below decks can watch the divers. Diving courses will be offered onboard in some areas; the ship will carry its own Dive Master, but will bring local instructors onboard, as well, because in many parts of the world, permits for diving are only issued when a local dive school is likely to benefit. A water sports platform at the stern will be lowered when the ship is at anchor. Free water sports in port will include snorkeling, sea kayaking, dinghy sailing and waterskiing. Activities when the ship is at sea will include supervised mast-climbing, a chance to be harnessed to the rigging and climb to the first crow's nest for magnificent views of the decks below. Passengers will also be allowed to lounge in the two nets strung either side of the bowsprit, generally regarded as one of the best places for sunbathing. On all Star Clippers ships, informal daily talks take place on knot tying, celestial navigation, the history of clipper ships and sailing technique. Sometimes, there are opportunities for guests to help haul on the lines to raise the sails. There will be a small spa onboard for Thai massage, facials and nail treatments. The new ship will also have a library and a function room for private events and guest lectures. Star Clippers offers no formal children's program or childcare, though activities for children are occasionally organized in the busy summer holidays. 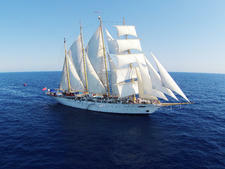 Star Clippers is better suited to older children than preschoolers. When it launches early 2018, the new ship will sail in the Mediterranean in summer and the Caribbean in winter.